Geraniums are distinctive beauties many gardeners enjoy growing in flower gardens or containers along decks and patios. To keep geraniums growing, they are often transplanted in the fall just before the first frost and brought indoors for winter protection. Once transplanted, your geranium should begin to show signs of new growth after the first month and should brighten your home until spring. Find a terra cotta pot that is just slightly larger than the pot your geranium is already in. If your geranium is planted in the ground, then an 8-inch pot should work. Layer the bottom of your pot with pieces of terra cotta or small rocks and then fill the pot a third of the way full with potting soil. Remove your geranium from its existing pot or dig up the geranium from the ground. As you work, keep the root ball of the plant intact in as solid of a mass as possible to keep stress on the plant down. Set the plant inside the pot. Adjust the level of soil below the root ball as needed to bring the upper level of the root ball to just below the rim of the pot by half an inch. Add more potting soil around the base of the plant to fill in any spaces between the root ball and the pot. Water the plant well to make the soil evenly moist throughout and set it in a sunny window in your home for the winter. Your geranium will need to receive four to six hours of direct sunlight at this location. Let the soil dry and then add enough water to wet the soil well as often as needed. Apply fertilizer to your geranium every four to six weeks following the manufacturer’s instructions for the quantity to use for your size of pot. Move the geranium back outside after the last spring frost for your region. You can leave the plant in the pot it is in to grow for the year or transplant it into the ground. If you don't want to repot your existing geranium, you can collect 6-inch-long cuttings and plant them in moist soil indoors to root. By the spring, your new geranium plants will be ready for planting into larger containers. 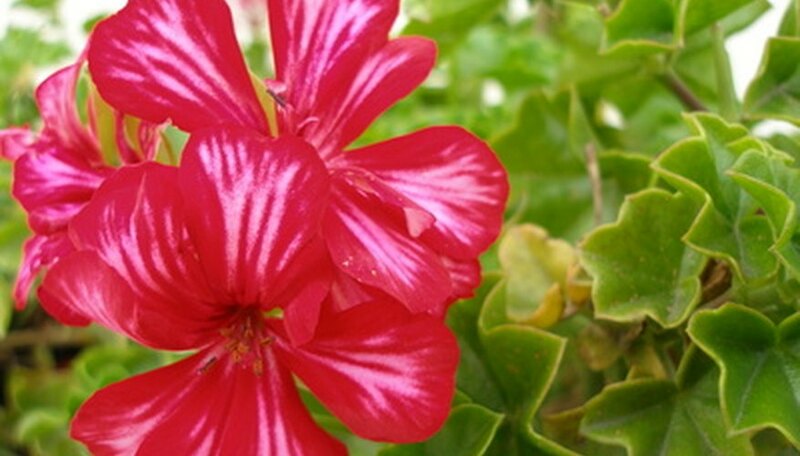 What Is the Meaning of the Geranium Flower?